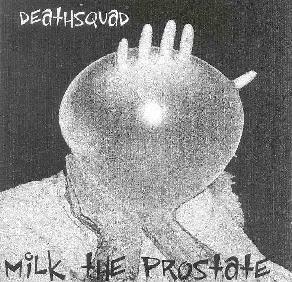 Deathsquad - "Milk The Prostate"
Great band name, but the music on this 6-track CDEP only occasionally lives up to the group's moniker. There's lots of grungy electronics, lo-fi drum sounds, and hard-edged guitars on the up-tempo numbers ("Pub Dog," for instance, is a blazing rocker that has the feel of early Wire with a jolt of Pere Ubu), but the less frenetic Deathsquad gets the more aimless and self-indulgent they become. I get the impression these guys are not particularly well-served by the extended play format and would be more in their element on a full-length disc that could more clearly highlight their strengths while putting their excesses in relief. Having said this, the early Chrome atmosphere that the best songs generate are very welcome, particularly "Hang the Paper Boy," with its malevolent Damon Edge/Jello Biafra-style vocal delivery and cloned Helios Creed axe murdering. "Battle Royale" is also noteworthy, its crushing synth sequence pounding its way like an angry behemoth through the tech-noir landscape of mutated samples and fuzzed guitar. Noteworthy for fans of punky post-rock with a decidedly experimental edge. For more information you can visit the Deathsquad web site at: http://www.deathsquad.org.